Manila—(PHStocks)—Philippine stocks ended their eight-day rally Monday, 27 January, as investor cashed in on their gains. 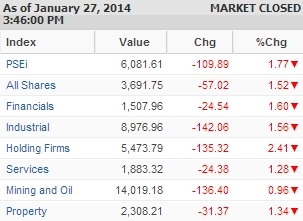 The benchmark Philippine Stock Exchange index (PSEi) shed 1.77% or 109.89 points to close at 6,081.61. All counters were in the red. The biggest losing segment was the Holding Firms sector, which dropped by 2.41%. The Financials slid by 1.6%, while the Industrials fell by 1.56%. The All Shares index retreated by 1.52%. Volume turnover reached 2.7 billion, valued at PhP6.8 billion. Foreign buying was PhP3.28 billion while foreign selling reached PhP4.82 billion. There were 26 gainers against 139 decliners, while 39 stocks were flat.